Welcome to AdvisorDesk Setup. Before you can access AdvisorDesk you must have valid user credentials provided to you by a member of National Advisors Trust Client Services. If you need assistance with either of these tasks you may contact National Advisors Trust atcs@nationaladvisorstrust.com or (877) 527-3476. Click on the link below when you are ready to begin setup. After clicking the link you will see the following at the bottom of your browser. Select ‘Run’. This will launch setup. During execution the following window will open. Exit the AdvisorDesk Setup once it has completed. If the setup ran successfully then you are finished on this page. 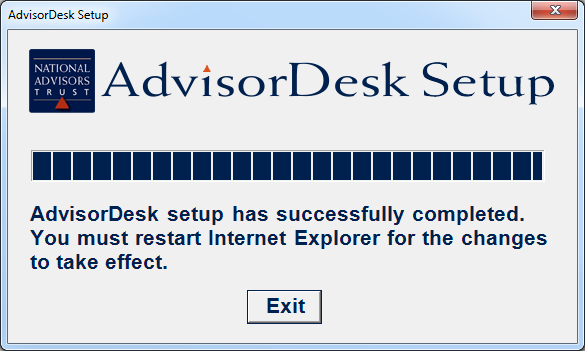 Restart Internet Explorer and navigate to http://www.advisordesk.com/ to access AdvisorDesk. 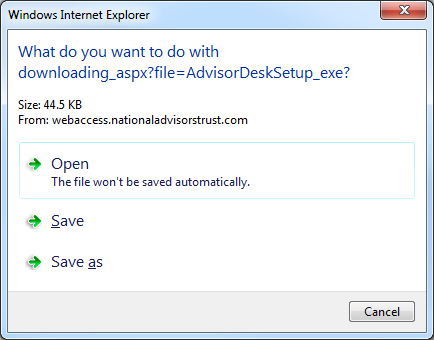 AdvisorDesk supports Internet Explorer 11. If you are using Internet Explorer 11 and experiencing issues running setup then read below. If you have any other issues related to setup or AdvisorDesk please contact National Advisors Trust Client Services. 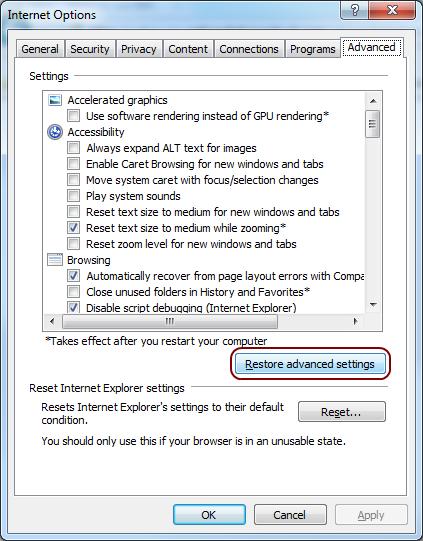 If you are using Internet Explorer 11 and running setup and get the following dialog. If so, you will need to perform additional steps prior to continuing with setup. Open Internet Explorer, click the tools button at the top right, and choose Internet Options. Navigate to the ‘Advanced’ tab and choose ‘Restore advanced settings’, then click ‘OK’. Once you have clicked ‘OK’ you must restart Windows. Please save any of your current work and restart Windows. Once your computer has rebooted open Internet Explorer and proceed with the AdvisorDesk Setup at http://setup.advisordesk.com.